^ Hallward, Peter (May – June 2004). "Option Zero in Haiti". New Left Review. 27 (May–June 200). Retrieved 20 May 2010. ^ Pierre-Pierre, Gary (21 January 1996). "Many in Haiti Are Troubled By Marriage Of Aristide". New York Times. Archived from the original on 12 June 2018. Retrieved 20 February 2019. 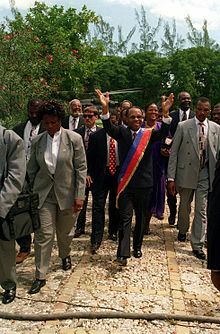 ^ "Aristide wishes to leave SA for Haiti". IOL News. 15 January 2010. Retrieved 19 April 2015. ^ Archibold, Randal C. (12 September 2014). "Ex-President of Haiti Put Under House Arrest". The New York Times.